I’ve seen a lot of social media posts telling believers with chronic health issues to just think positive and remember that we’re going to heaven one day. I’m sure they mean well, but I’m also sure those that write these haven’t experienced chronic health trails. They tell me to ignore the present and look to my future. The problem with that is I can’t ignore my present. 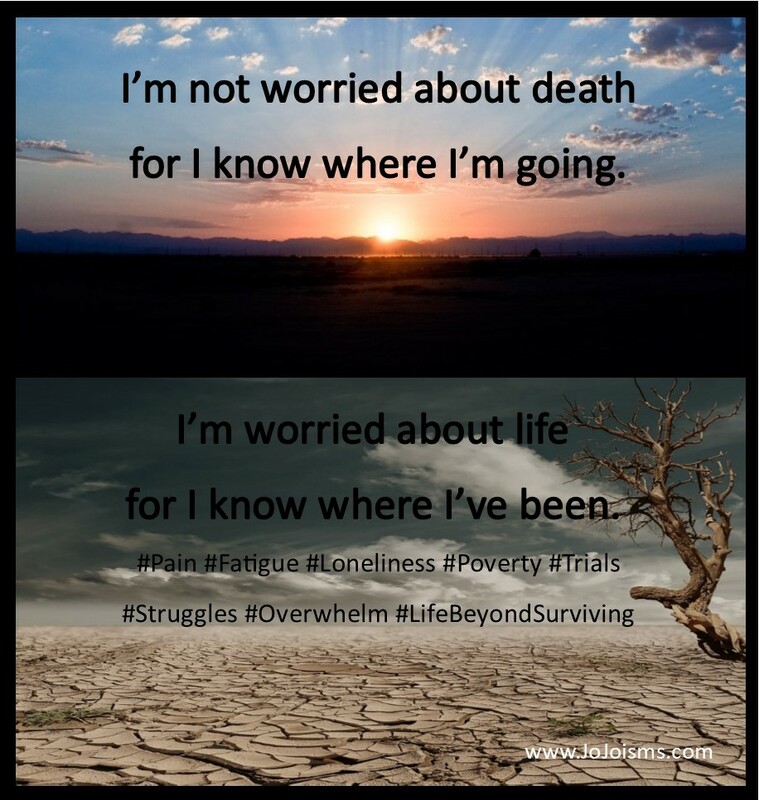 I do a good job of putting it out of my mind and keeping myself busy with my mission, my work, and finding the joy, but there comes times in every Survivor’s life when things of the world take precedence, even for a short time, and we become overwhelmed, fatigued, and frustrated. I was thinking about that the other day when I saw one of those memes and created this. I’m not worried about my eternal soul for I know I’m destined for Heaven. I know that, in Heaven, there is no pain, or struggle, or tears. I know that Heaven will be worth all the struggles and trails and frustrations. I know that I will eventually know a peace I can only dream about here on Earth. What I worry about is life with its hardships and pains, with its frustrations and difficult decisions. 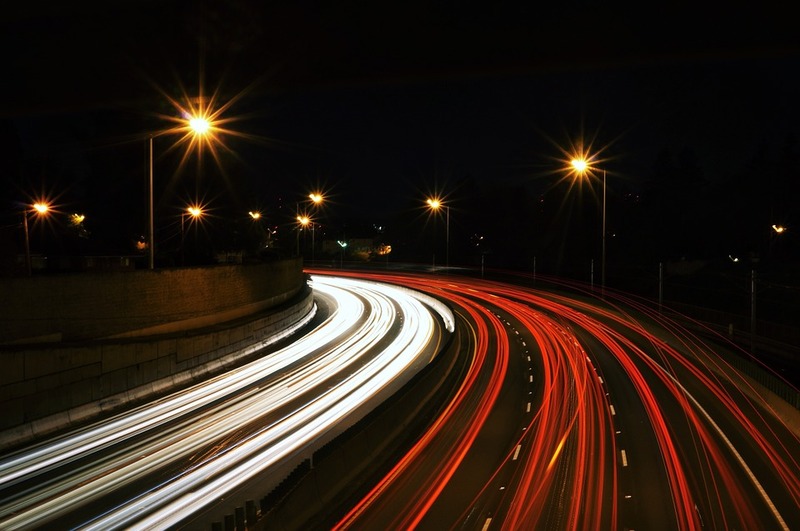 I’m worried about which path to take, what bills can wait, and how I’ll get through the day. We are told we are in the world, but not of it, but what many who have not gone through constant trials for so long just don’t understand is, we may not be of the world, but we are still in it. I don’t worry about my future and I don’t live in the past, but I do struggle in the present. Partly that’s because it’s here and I can’t escape it and partly because it’s the only thing I can do something about. If I have the ability to do something, I feel I should be careful in how and what I do. Having to deal with pain and fatigue and financial stress and business decisions and overwhelm makes that all the more difficult. I’m not saying we can’t have joy. I’m saying it isn’t all fun and games. Subscribe to our mailing list, Grape Value News, for freebies, gifts, and discounts on products/services for your family! 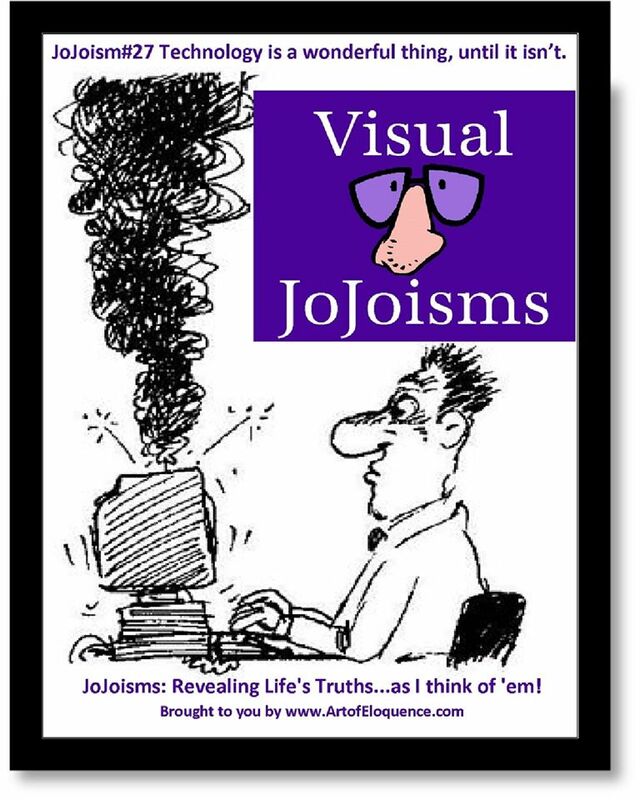 So the other day I was going through some of the JoJoisms I’d written a while back to see if I had any I felt strongly about making into a visual version. This one stuck out. I’m not saying I’m all that old, though my kids would have you believe otherwise. I’m just saying that on the road through chronic illness, there’s some rest stops along the way that make you feel old. I was recently taken off my beloved muscle relaxer due to a rapid heart rate and jitters/tremors. I’m still jittery and my hands shake, but it’s not as bad as it was. Unfortunately, my dr wants me off the muscle relaxer until I see her again this month. I’m not happy as I’m not sleeping as well…some days are worse than others. And I’m in more pain during the days. So I FEEL older than I think I should at 55. I’m over six months past my last (and hopefully FINAL) surgery–this time on my ankle. I had wanted to start my new exercise program which looks easy and fun and has all the earmarks of something not that difficult for someone whose muscles have grown weak from all the couch potato-ing I’ve been doing. However, just starting the first day of my CD rom, was exhausting. I’ve tried it twice now and I get fatigued closer to “let’s begin” than I’d like to admit. I’m going to wait until I see my dr again and see what can be done. In the meantime, I remain your humble, purple, and tired corespondent…who feels like she’d like an out of body experience. 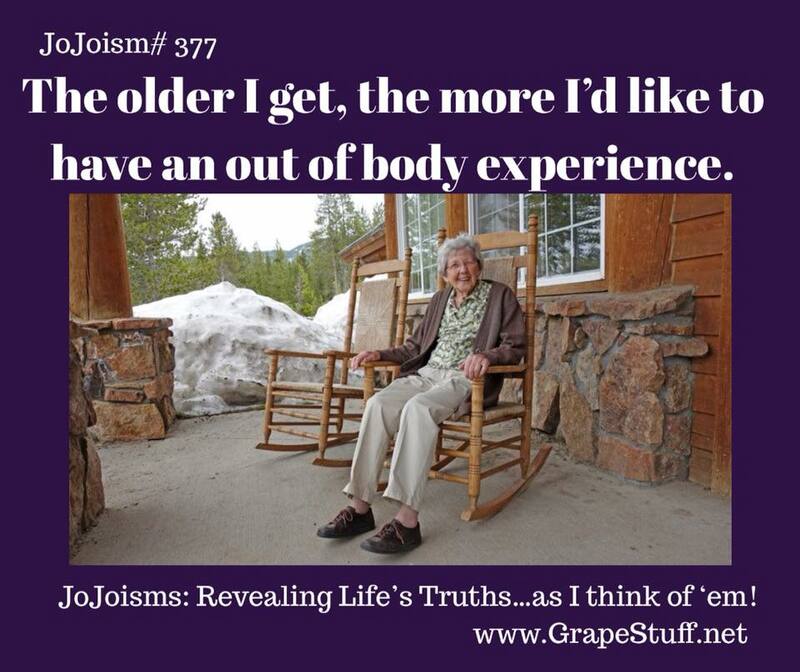 Posted in New JoJoisms | Comments Off on How many of you would like an out of body experience? 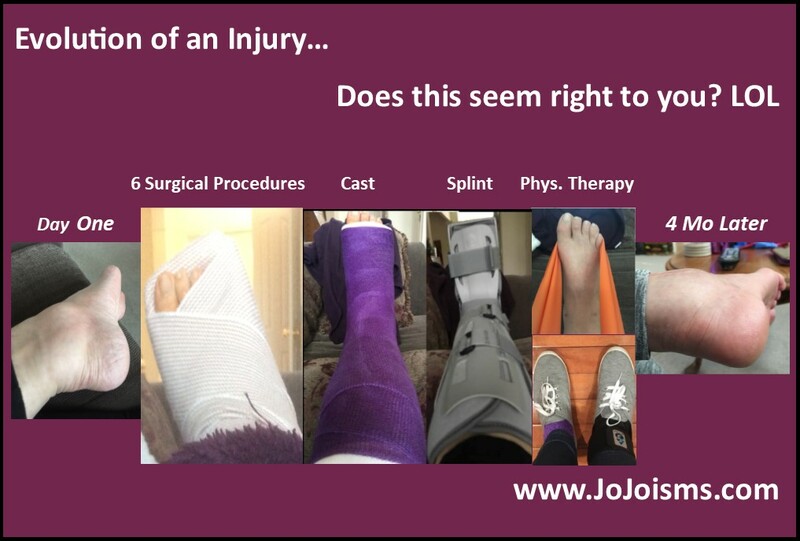 So the other day, I had to go back to my surgeon for a follow up five months after my ankle surgery. They took my blood pressure and heart rate and found my resting heart rate was abnormally high. That prompted the nurse to tell me that he was required by law to tell me to call my regular doctor. Well, that sounded rather ominous, but I thought it was probably a formality. I got home and did a little research as I was getting increasingly jittery and had a headache as well as having my hands shake more than just after I’d had my coffee. What I found is that the muscle relaxer I was taking could cause these things and it said to “call your doctor immediately” so, I did. She saw me very early that morning: BC (Before Coffee) and took me off my muscle relaxer and ordered some blood work. That was on Friday. I didn’t expect to hear back from her til the following week, but as this is the technological age, I received an email with the results and her recommendations. All the blood work was normal (including my cancer markers for the last three months! YAY!!) and she suggested I stay off the muscle relaxers til I see her at my April appointment. Looking at the paperwork it suddenly occurred to me that there aren’t too many times in my life that I’d been called NORMAL. Normal. It just kept echoing in my mind. That prompted me to create a meme that represented what I saw in my head. 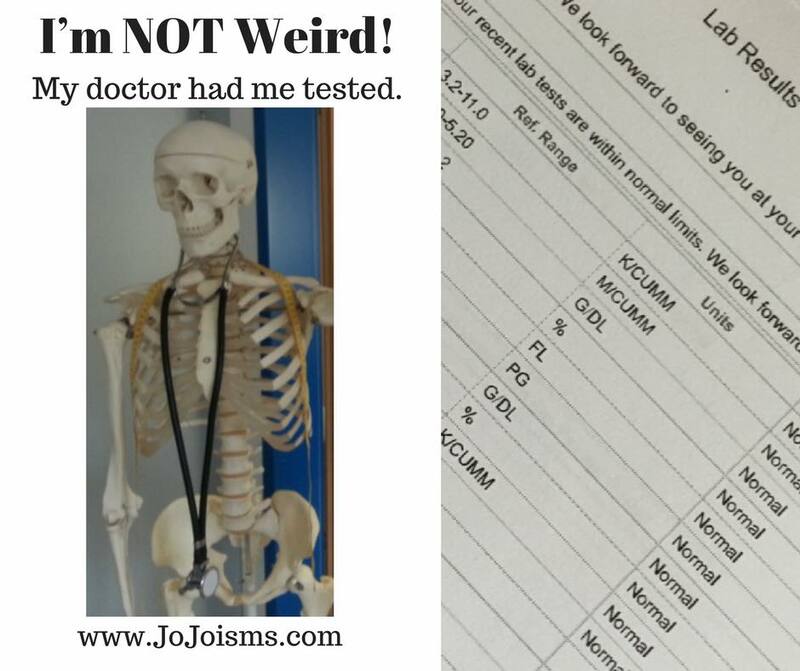 So, here it is…I’m not weird; my doctor had me tested! 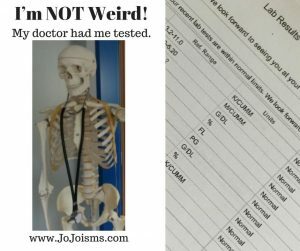 Posted in Laughing Through Struggles , Big Bang Theory, blood work, Coffee, doctor, I'm not insane, My mother had me tested, normal, Sheldon Cooper	| Comments Off on I’m Not Weird; My Doctor Had Me Tested! I wrote this saying from out of all the times I’ve wandered into the family room looking for a sandwich. I’ve had insomnia since before my son was born–18 years ago. I’ve tried just about everything, but the only thing that works for me is a muscle relaxer. It’s used for Fibro pain (which I have also), but has the added side effect of making you sleepy. I take it at night before bed. Most nights I sleep much longer, though I still get up a few times a night. However, SOME nights are like last week. I dreamed that Mug Man had to go somewhere and my son was supposed to drive us home from somewhere weird where we’d been for an unspecified period of time. My son knew the way. I didn’t and it was late so he drove, but we quickly realized he took a wrong turn. So we stopped at a tri-level auto garage to ask for directions. Leaving the garage, my son, my MIL, and I had to navigate down some steep yet narrow steps that almost resembled a ramp. My MIL is 93 so I was a bit concerned, but in heartbeat we were in the car traveling down the street when we realized that it was covered with quite uneven ice patches. I told my son to be careful when suddenly the street became a water slide ride. Fearing the water would seep into the cabin of the car, it morphed into a Flintstone-esk log car. After a minute or two, we noticed that the ride hadn’t finished construction yet and so we began yelling for the construction workers to help us. Dressed as Keystone Cops in rain attire, they just looked at us and smiled. That’s when I woke up. Mug Man told me to go back to sleep, but I was not yet ready to finish that ride so I went into the living room to do a bit of social media. Later, Mug Man couldn’t sleep so he, too, came out to the living room and, both sleepy, but unable to sleep, we sat there looking at each other. Suddenly, Oatmeal Girl appeared! She was so proud of herself for making all gone that she had quite a look of pride on her face. Her father’s face was a bit different as most of the oatmeal was on his daughter’s face. She was especially cute at that moment when a man appeared next to her and told her she was so adorable that he wanted her to be his baby girlfriend. I wasn’t quite sure I liked the sound of that. That’s when I woke up. Mug Man was snoring. After a few minutes, a large cartoon looking woman dressed in a flowing blue dress with an orange scarf tied around her hair and holding a red bar of soap floated behind the couch. It occurred to me that nobody could float BEHIND the couch as it backs up to the wall. That’s when I woke up. That’s also when it finally seemed odd that she would be floating at all. Looking down at the large pot of hot water that was sitting on the BBQ in the family room, I noticed that, as the pot warmed, the pot became pliable and morphed into a heart shaped pot. But we don’t have a BBQ in the family room so it was suddenly in the kitchen on the stove. That’s when I woke up. I decided that, since I’d been asleep for maybe two hours total and it was already 7:45am, I’d might as well get dressed for church. I was a bit concerned that I might shower with toothpaste, but it wasn’t IN the shower so-problem averted. I hadn’t yet had my coffee…which might explain why I almost walked out of the shower before realizing I hadn’t yet washed my hair! Cyclobenzaprine (muscle relaxer) does warn you that you may have “weird dreams” from time to time. I think these would fit that description, don’t you? I’ve always said that my life is like a series of comedy sketches and all I do is write them down. Having had chronic illness for almost 40 years, been married for 31 yrs, and a mom for 27 years, I think that Sanity Isn’t All It’s Cracked Up to Be. There are times when things are frustrating, but it certainly makes for an interesting life, don’t you think? 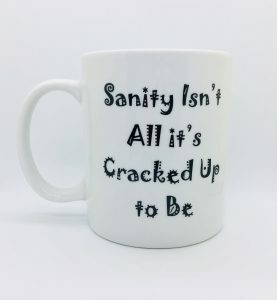 Posted in Laughing Through Struggles , BBQ, couch, cyclobenzaprine, dreams, garage, kitchen, Mug Man, Sanity Isn't All It's Cracked Up to Be, shower, son	| Comments Off on Sanity Isn’t All It’s Cracked Up to Be! So here’s the thing…I wrote up all the JoJoisms I had in what I called, The Big Book of JoJoisms. I had 572 of them. But, as you know, I’m always writing them…always finding life funny. So I wrote a few more and got up to 577. And then it happened. 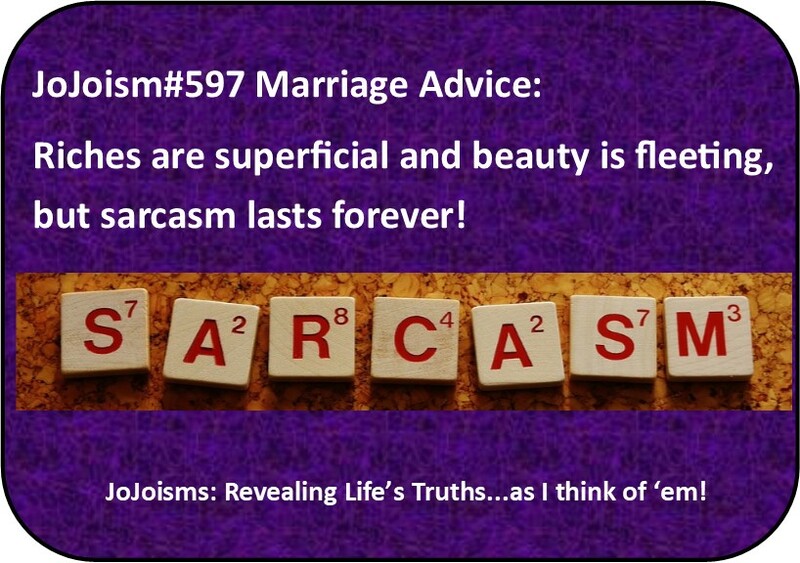 I found a JoJoism I had written a while back and turned it into a Visual JoJoism. It’s numbered 597. So, I seem to have 20 JoJoisms that are either MIA or never existed in the first place. 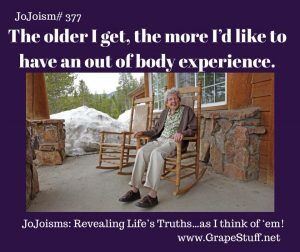 Did I lose 20 JoJoisms in the brain fog of my mind? or did I look at 576 in my uniquely un-bifocaled state and think it said 596 so I wrote 597? The Information Age comes with a sad truth that communication, as we know it, is on the decline. I’ve written about this often on Art of Eloquence, but it continues with a certain flair this past month and so I had to share three examples of irony-the likes of which are rarely seen outside of nonfiction novels. 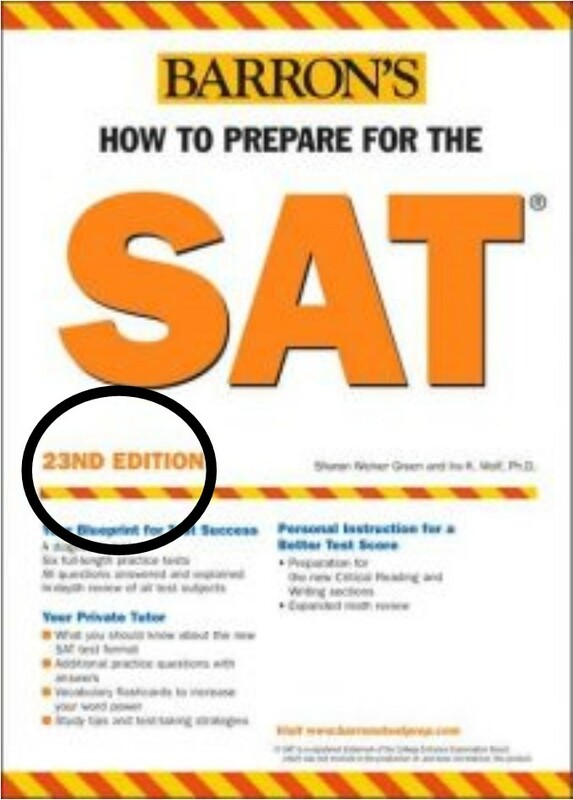 ONE: Long ago, in a College Prep galaxy far, far away (translation: ten years ago in California), we were looking for SAT prep books for my daughter and found this <=== highly successful publisher’s “latest” edition. 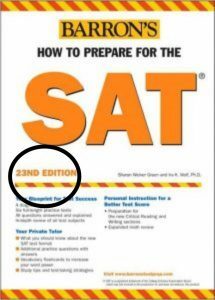 Somehow we felt it lacked a certain something and moved on to a slightly lesser known, yet much better edited, SAT prep book. TWO: Just a few weeks ago that same daughter, who has since graduated from graduate school, was sent an email from Phi Beta Kappa asking her for donations and announcing its 141TH anniversary. No, it wasn’t just one typo, it was stated the same way THREE TIMES in that same email. Perhaps this are why the Chinese are 1ndthst in academics?